At the recently concluded sessions of the Cybercrime Convention Committee (T-CY) of the Council of Europe in Strasbourg, Sri Lankan attorney Jayantha Fernando was re-elected to the Bureau of T-CY. The Council of Europe Convention on Cybercrime (ETS 185), also referred to as the “Budapest Cybercrime Convention”, is the only global treaty on Internet and computer related crime and improves investigative techniques based on international standards and enhances criminal justice cooperation among nation states to effectively combat the threat from cybercrime. The Bureau of the Budapest Cybercrime Convention Committee, consisting of a Chair, Vice Chair and 9 elected experts from across the world, is tasked with the effective implementation of this important International treaty at a global level. The Budapest Cybercrime Convention is a Council of Europe Treaty, open for non-European countries to accede. Australia, Argentina, Canada, Japan, Costa Rica, Dominican Republic, Mauritius, Morocco, Philippines, Senegal, UK and USA along with 61 Countries are state parties to this Convention, while many countries have either signed it or invited to accede. On 1st September 2015, the Convention entered into force in Sri Lanka, and it became the first country in South Asia to become a state party to this Convention. The ICT Agency of Sri Lanka (ICTA) and Sri Lanka CERT, which functions under the Ministry of Telecommunications & Digital Infrastructure, took the lead initiative to facilitate Sri Lanka’s entry into the Convention, along with Ministries of Justice and Foreign Affairs. 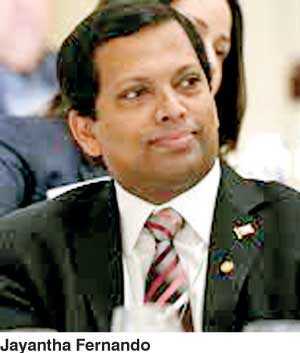 Jayantha Fernando serves as Legal Advisor of ICTA and Acting Chair of Sri Lanka CERT. Fernando’s nomination was proposed by Australia, Estonia and Portugal and he was elected unanimously with other state parties supporting the nomination. He is the first from a South East Asian country to be elected to the Bureau of the Budapest Cybercrime Convention.